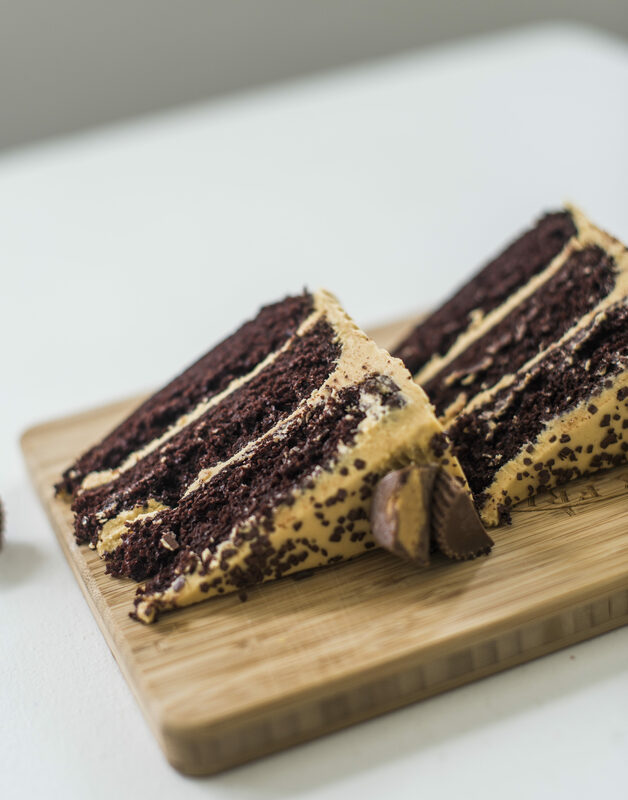 Rich, decadent, dark chocolate cake layers with whipped peanut butter frosting make this cake hands-down the best chocolate peanut butter cake you’ll ever have! That’s a promise. I love getting creative with my cake flavors and texture combinations, but there’s something about the classics that never get old. I shared a lot of classic cake flavors when I first started my blog a couple years ago. I’ve been meaning to revisit them ever since. I finally had a chance to work on several of them this past month and can’t wait to reintroduce you to many of them. First on my list is my favorite flavor combination: chocolate and peanut butter. I never get tired of this combo, in any dessert. It always works! I especially love this pairing in cake form. 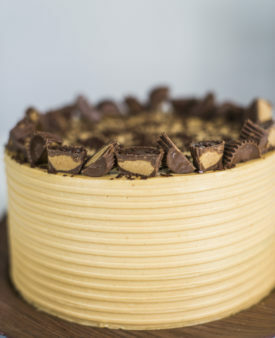 Bittersweet, rich dark chocolate cake, paired with a sweet and salty, whipped peanut butter frosting is like heaven on earth. Neither element over powers the other. They compliment each other so well. The chocolate cake is my High Altitude Friendly Chocolate Cake. It’s a cake I worked on perfecting for several months after moving to Utah and having the original recipe fail on me over and over. The recipe is pretty much fool proof at this point. And don’t worry if you’re in lower altitude or higher altitude. I’ve got you covered. If you’re at low altitude, you won’t need to change a thing about this recipe. I’ve made it several times in Southern California and haven’t run into any baking issues. If you’re at higher altitude than Northern Utah, there’s a couple steps you can take to make sure you’re chocolate cake doesn’t sink. For every cup of all-purpose called for in the recipe, add an extra tablespoon of flour (in addition to what I already have added). For every cup of sugar called for in the recipe, remove a tablespoon of sugar (sugar tends to weigh cakes down at high altitude). Make sure your baking powder and baking soda are fresh (don’t use them if they’re over 6 months old). Don’t over mix the batter! You only need to mix the batter on low speed, just until the dry ingredients are incorporated. For the frosting, you’ll want to make sure the heavy whipping cream is chilled before you start to beat it. It also helps the whipping cream to thicken quickly if you freeze your mixing bowl for about 15 to 20 minutes before you start beating. I also suggest using smooth peanut butter. And if we’re getting really specific, I also suggest using Skippy Peanut Butter – for no other reason than it’s my favorite! 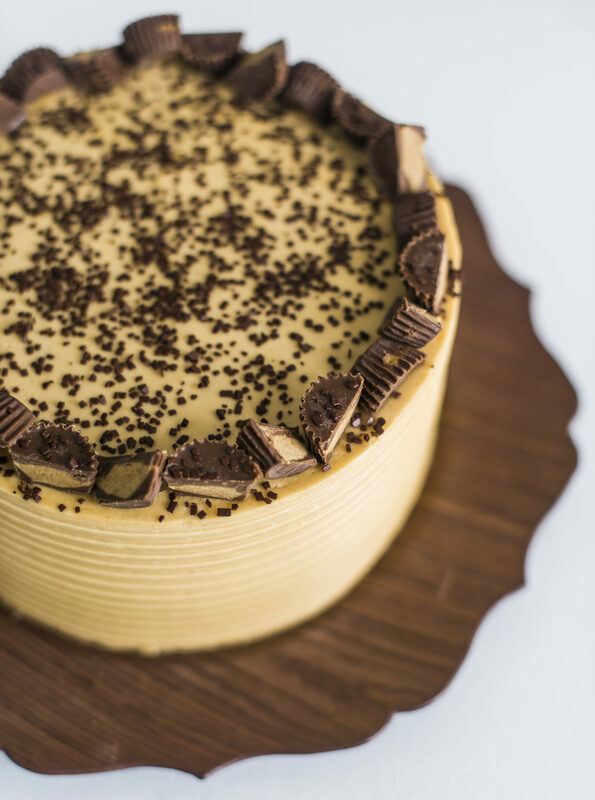 You’ll want to level the cake layers, if needed, to ensure your cake stacks evenly. Chill the cake layers for at least an hour in the freezer before frosting. Working with chilled cakes will make frosting the cake much easier – you’re less likely to get crumbs in your frosting. Make sure to do a crumb coat before you frost the entire cake. The chocolate crumbs are moist and easily get stuck in the frosting if you don’t do a crumb coat. Remember, the crumb coat is just a thin layer of frosting that you freeze for 10 to 15 minutes to set. This will lock in the crumbs so your final coat of frosting is crumb-free. Ok! I think you’re all set to go. Hope you enjoy this cake as much as I do! 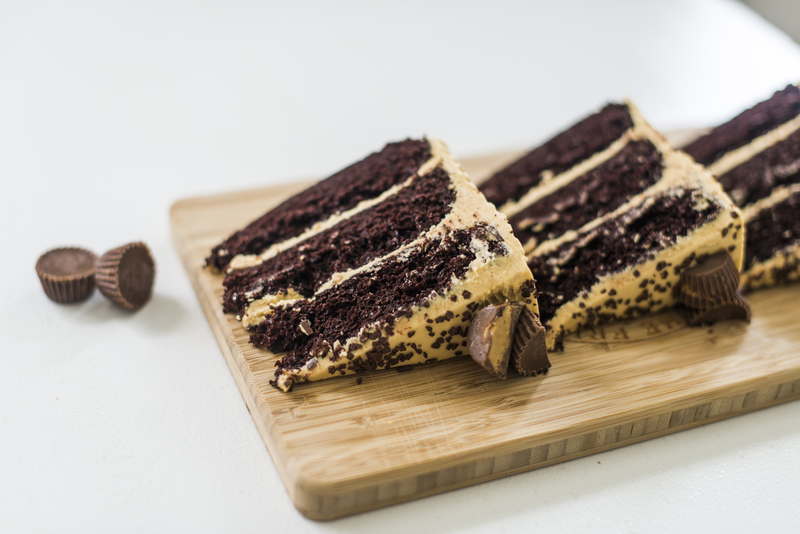 Rich, dark chocolate cake layers with whipped peanut butter frosting. Preheat the oven to 360 degrees F. Prepare three 8” round cake pans (butter or spray, line bottom with parchment paper, butter or spray paper and dust with flour). In a bowl of electric mixer, combine all the dry ingredients. Combine eggs, buttermilk, water, oil and vanilla in a measuring cup and lightly beat with a fork. Add wet ingredients to the dry ingredients, and mix on medium speed for two minutes. Batter will be thin. Scrape sides and mix for another 30 seconds. Divide batter evenly among prepared pans (I like to use a kitchen scale to ensure the batter is evenly distributed). Bake for 18 minutes (you may need more time depending on your oven), until toothpick comes out almost clean. Cool on wire racks for 10-15 minutes, then gently invert onto racks until cooled completely. When cakes are completely cooled, I like to wrap each cake layer individually with plastic wrap and stick it in the refrigerator or freezer until I’m ready to frost. The cake will be easier to work with if it’s cooled a bit. If I’m making the cake a day or two before I actually need to frost it, I put it in the freezer to ensure freshness. If I’m frosting same-day, I’ll just put it in the refrigerator to chill until needed. In the bowl of electric mixer fitted with the paddle attachment, combine the butter and peanut butter. Beat on medium-high speed until smooth, about 45 seconds. Add the powdered sugar to the bowl and mix in, slowly at first until incorporated, then increasing the mixer speed to high. Blend in the vanilla extract, salt and heavy whipping cream, and continue to whip on high speed until very fluffy, about 4-5 minutes, scraping down the sides of the bowl as needed. Courtney!!! Thank you, thank you!! I made this cake for my son’s birthday and it got nothing but praise!! It was SO DELICIOUS!! And the frosting!! Girl I could eat it and only it the rest of my life! You’re amazing, thank you for sharing your talents!! Can’t wait for more celebrations so I can try more of your cakes!! I also really liked this cake. My sister made it for my birthday and it has the best peanut butter frosting I’ve ever had. Its so moist and fluffy, I’ve never had any cake this good! Are there any issues frosting this cake a day early? I’ve never made a frosting with whipped cream folded in and wanted to make sure it could sit at room temp for a day. Your cakes are the fluffiest, moistest, most delicious cakes I’ve ever had. This cake is one on my favorites! Your peanut butter frosting is so smooth and soft, some of the best icing I’ve ever had in my life! It’s one of my favorites too. Thanks for your sweet words! I really like your cakes, they are the fluffiest and moistest cakes I’ve ever had. 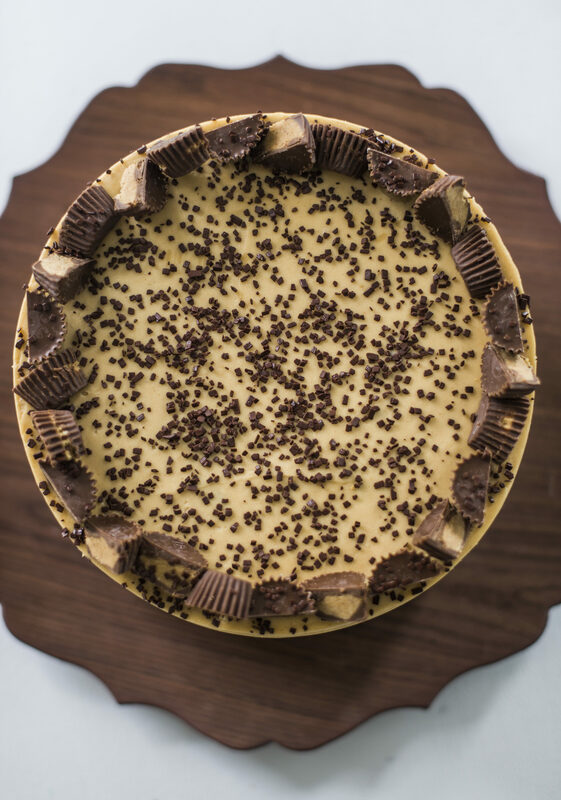 Also your peanut butter frosting is to die for! Thank you!!! I’m so thrilled to hear that!!! Can I use this recipe in a 8 by 3 inch deep cake pan? Wait, sorry, just reread this – no, I wouldn’t put it all in one pan. You need three 8-inch pans. height of them won’t matter. Hi there!! I have been eyeing your cakes for ever and am finally ready to take the plunge!! In this recipe, it calls for large or extra large? Have you made it with both? I just worry about the extra liquid in the extra large vs large and wonder which I should go with or if it truly hasn’t made a difference in the results! Thank you for sharing so many fun and delicious recipes! I saw you on Studio 5 talking about making a homemade cake, I have never had luck with scratch cakes. My son’s birthday is tomorrow I decided to try your recipe out. The cakes are made and in the freezer. I am going frost and finish it tomorrow. But holy cow, just the little slivers I cut off to even out the cakes were amazing! Thank you for sharing!!! Yay! I hoped you loved it!